Hello everyone! 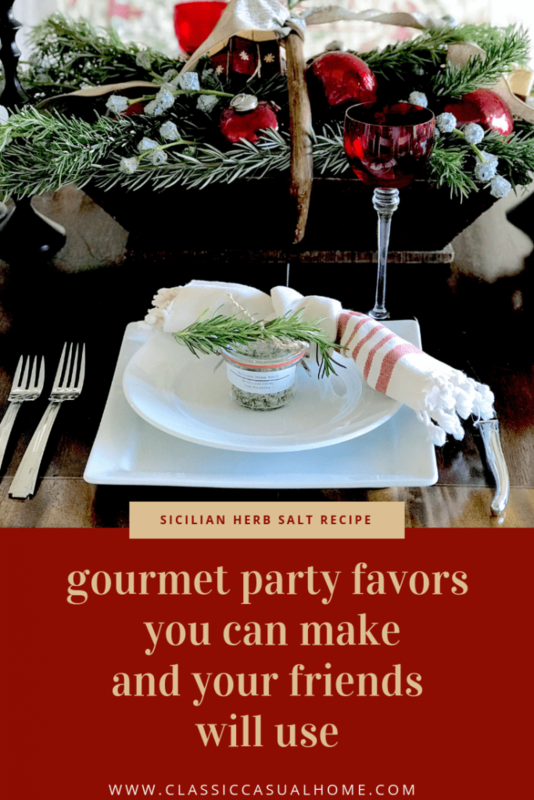 This year for our Holiday Table, I was inspired to make gourmet party favors from a trip to an herb farm in Sicily. I think it’s fun to give guests little gifts any time of year but especially at Christmas! I know this is early (before Thanksgiving), but research shows that people are looking for inspiration now (and pinning to Pinterest). 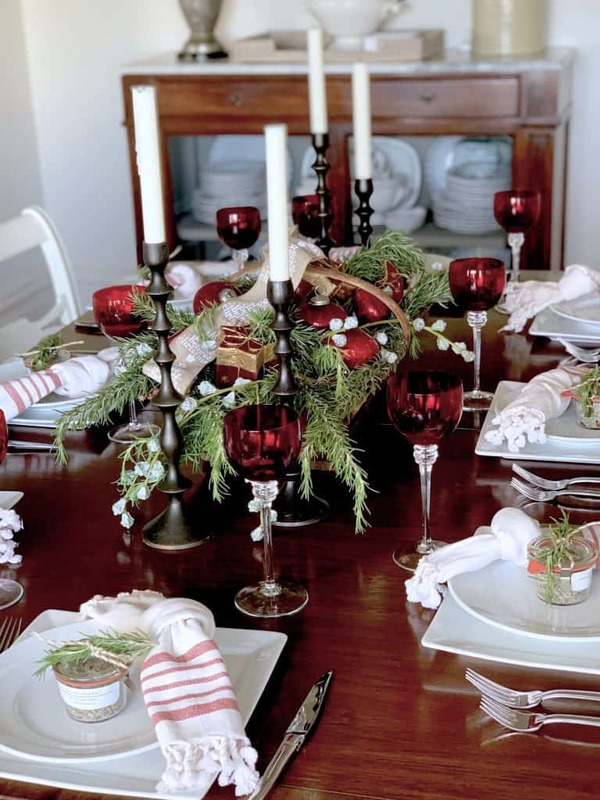 Anyway…it feels great to have my Christmas table ready to set when the time comes. 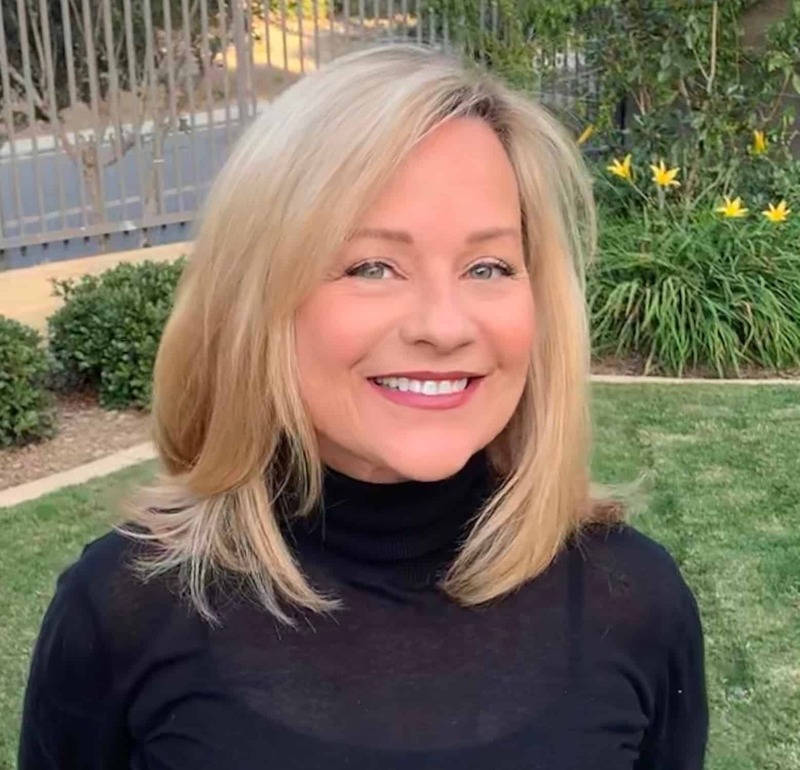 Cindy, Annie and I have invited Celia from After Orange County, Kelley from Polished Pebble and Yvonne from Stone Gable (all amazing hostesses) to inspire us. Be sure to check out their links at the end of the post. I got my glasses several years ago, but these are similar... I think they add a little sparkle. 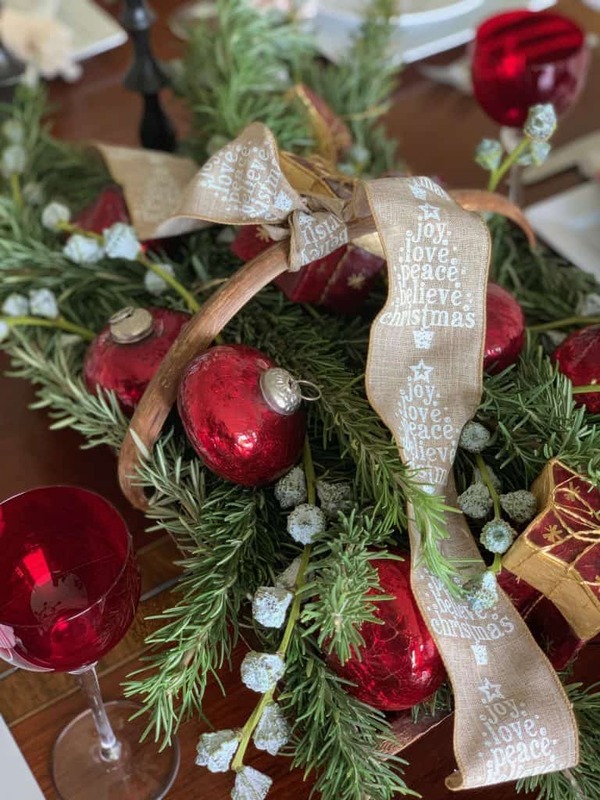 I filled this old wooden fruit basket with paper on the bottom and then layered fresh rosemary and berries and ornaments. You could use any basket and greenery, but the rosemary seemed to go with my “herb” theme. I tied the basket with ribbon that I got at Home Goods last year. These napkins from Pottery Barn (a few years ago) are unironed and casually tied in a knot. These are some inexpensive striped napkins from World Market. This square plate is similar to the china that we use every day. We got ours in France. The salad plate is from Apilco. White goes with everything and they are chip resistant. 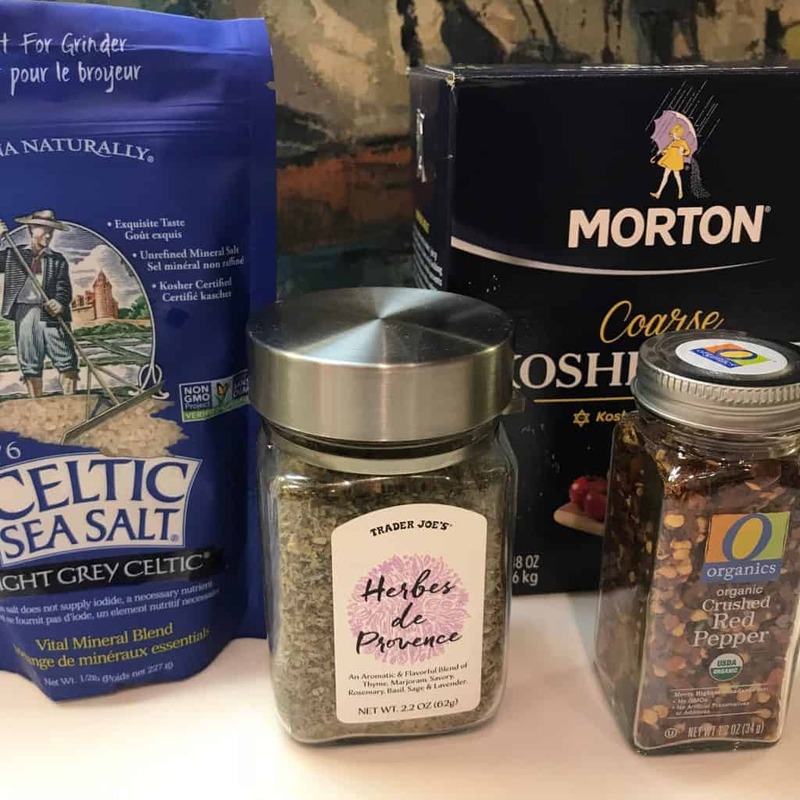 Ideally, you would use some of this salt in your dinner menu…on roasted vegetables or chicken or in your salad dressing. Use this salt on roasted vegetables and meats or in salad dressing. 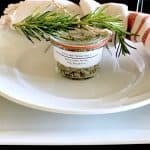 Place in Weck jars for party favors. Spoon into jars and cover. The mini Weck mold jars came from Amazon and address labels from Vista Print. The labels weren’t expensive so I have a bunch left over. 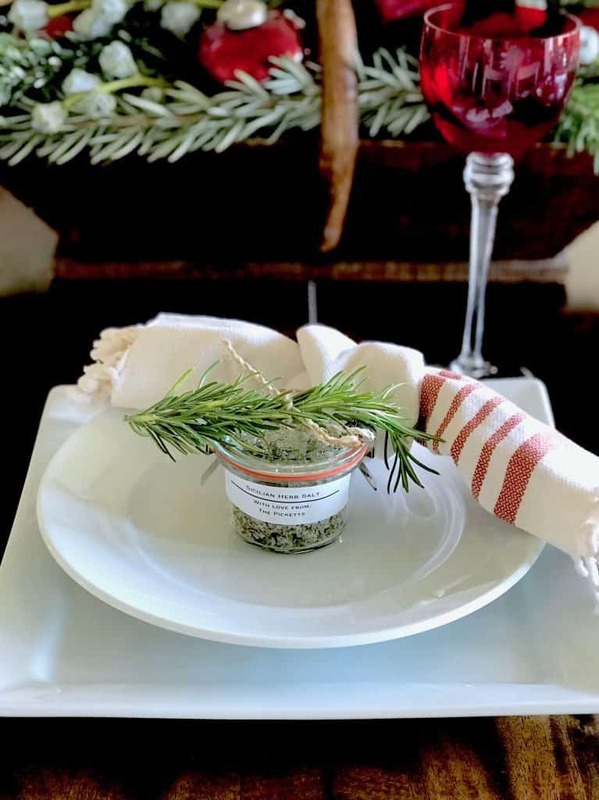 I simply tied some fresh rosemary with twine. I have to say this table arrangement smells fragrant! 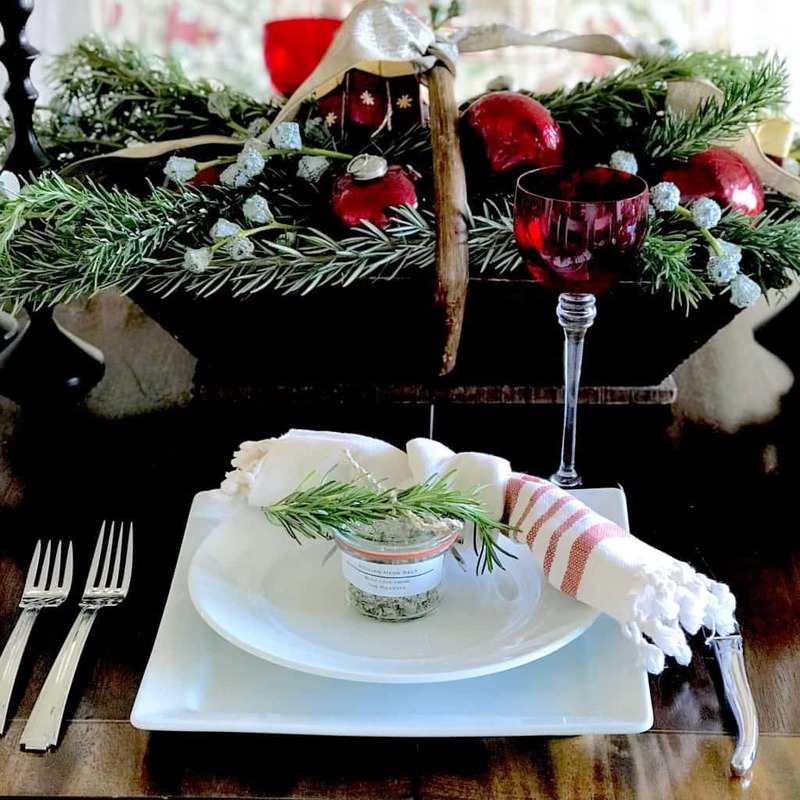 Why not give your Holiday Table some gourmet favors? If you have children at your table, you could also put red jelly beans from Amazon in the jars. 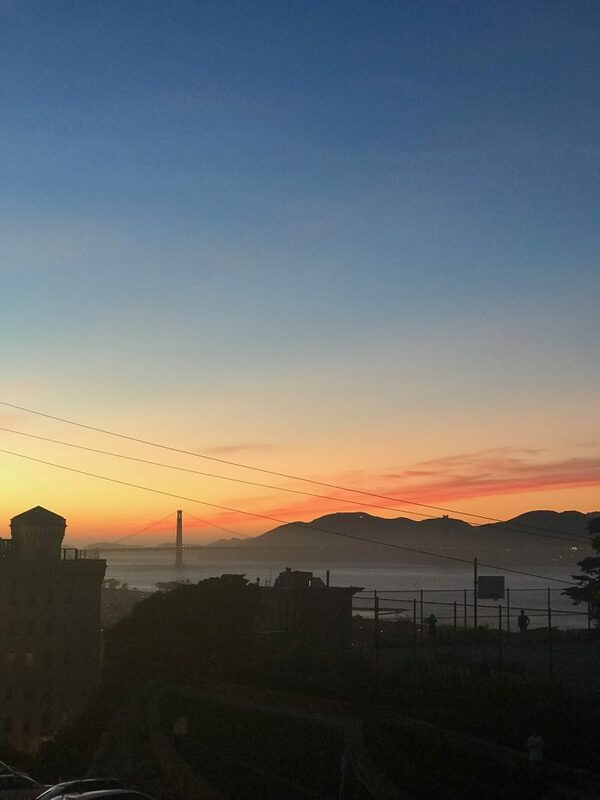 The sun is setting behind the Golden Gate bridge earlier now. So, I am lighting candles and enjoying my family. I hope to keep this holiday season simple and peaceful (not always easy). Wishing you and your family the same. 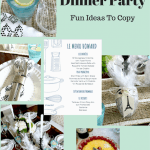 MaryAnn, I LOVE, LOVE, LOVE this idea for a party favor! Each year I host my Book Club at Christmas and every year I give each of the ladies some kind of homemade favor. One year it was homemade Limoncello, another year it was Mulling Spices, etc., but this year I am fresh out of ideas, that is until now. You have solved my dilemma. And I’m going to try Vista print for the labels too. Thank you! Great ideas beautifully executed! Your view is amazing. thank you for sharing it! I love homemade gifts, and this one is perfect! I typically make sweet things to give but now I have something savory for my guests as well. I love your holiday table. Can’t wait to check out the links. 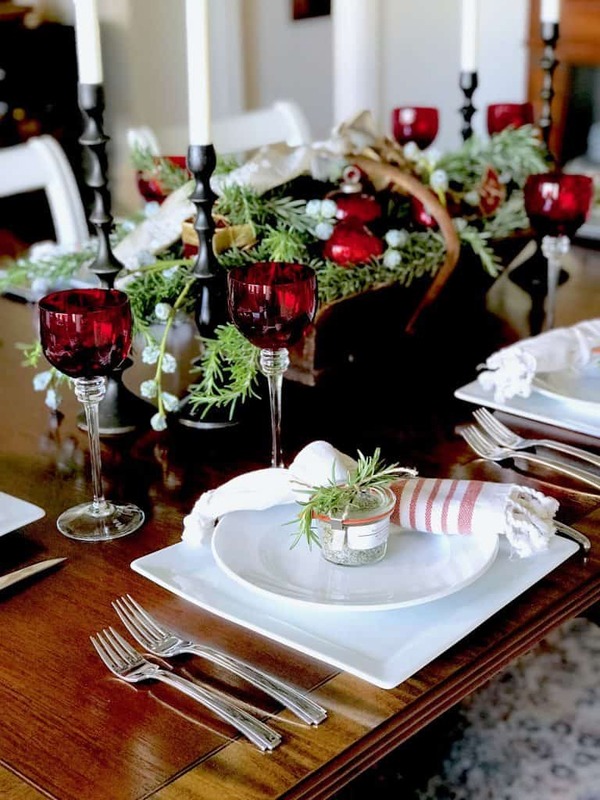 How you come up with so many original tablescape ideas year after year amazes me. You always think of the perfect giveaway. The table will sparkle with your gorgeous view in the background. I hope you repeat this for some of your friends. It is absolutely charming. I personally think this is one of the best PD’s we have ever had. Everyone “rocked” it in their own special way! I usually just mix up things I already have with one new element (like the sea salt). I love the little spice gift jars. 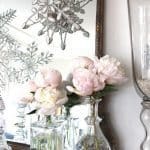 It’s the perfect time to get the recipe and jars and labels for taking care of those little hostess gifts I love to do this time of year. Thanks you! 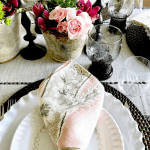 Your table is beautiful and I LOVE the salt party favor idea! Have a great weekend! 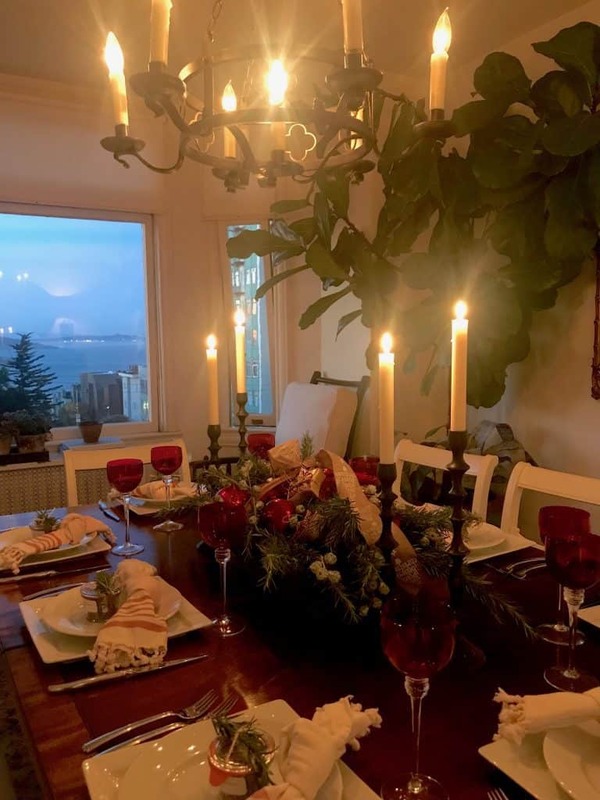 Beautiful table setting Mary Ann! All of you ladies have such good ideas and the variation in color themes is inspiring! clever clever you! the table setting is gorgeous and I am stealing the salt idea. 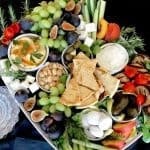 when I entertain I love to send guests home with a gift, any time of the year. this is a great idea, and EASY. on the bell eucalyptus…..I sell it at the shop along with fresh greens, we always tell people to be careful using indoors. as it dries, the pungent scent of cat urine permeates the house! That’s a good tip! Right now I have the bell eucalyptus (didn’t know it was called that)…in water. But last year I had it in a wreath and didn’t notice the smell…I will be careful now though!!! 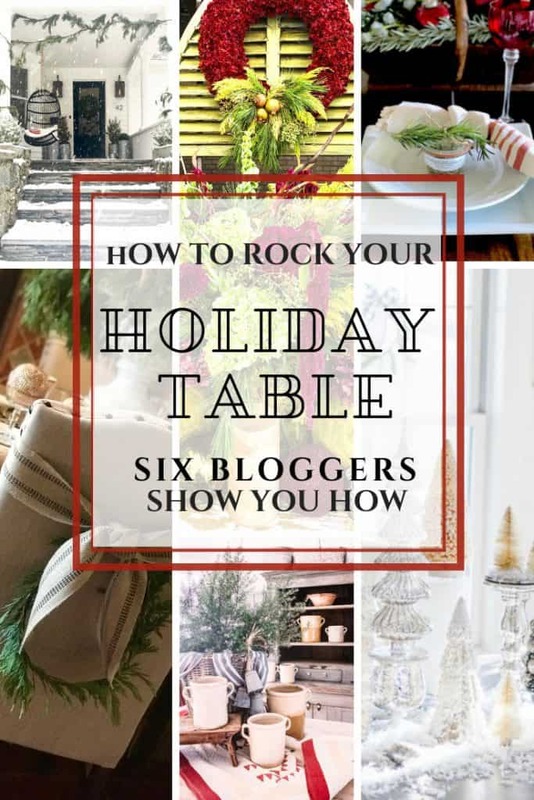 Of course, I’m in love with your holiday table setting. I always think I should try something new other that the traditional red and green. But when I see a gorgeous setting like yours, I think it doesn’t get much better and is so traditional. It’s fun to pull out the red this year, Gail. I haven’t used it in a while. Enjoyed this so much Mary Ann! What a warm, fun place to celebrate together! Thanks for the inspiration. Thanks, Pat. Love your Instagram photos! YOU ARE HALF WAY THERE!! !